Ramirez (1-0) picked up his first win of the year after yielding just two hits over five shutout innings. The 25-year-old right-hander allowed the first two baserunners of the contest to reach safely, but rebounded by facing the minimum over his final 13 batters faced. He struck out four and walked just one, and he's now thrown 9.0 shutout innings to open up his 2019 campaign. It was the third career start against the Mud Hens for Ramirez, who is now 3-0 with a 0.60 ERA (1 R, 15.0 IP) against Toledo. Flaa followed Ramirez out of the bullpen with three sterling innings, striking out three without allowing a hit. 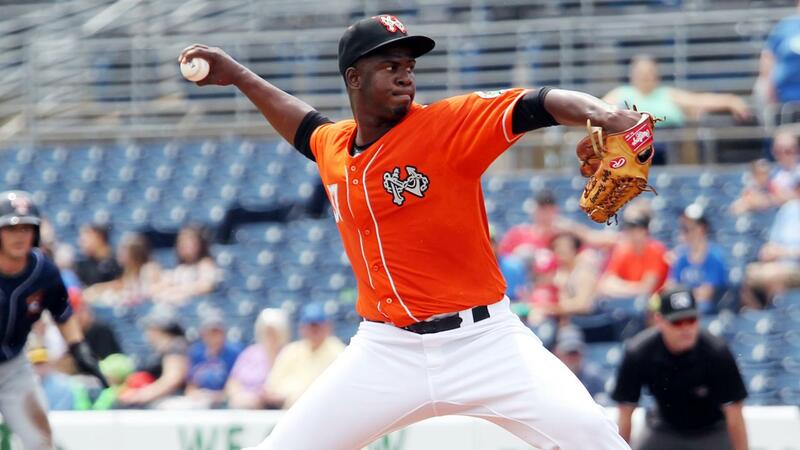 Since being promoted from Double-A Bowie on April 11th, he's fired six shutout innings while limiting International League batters to an .056 average (1-18) with five strikeouts. Gonzalez capped the gem by working around two singles in the ninth to earn Norfolk's first save of the season. It was also the second shutout of the year for the Tides, who earned a split of the four-game set with the victory. The Tides got all the runs they would need in the fifth frame, as they finally got to Mud Hens starter Kyle Funkhouser (0-2). Funkhouser did not allow a hit through the first four innings, but Christopher Bostick and Carlos Perez opened up the fifth inning with consecutive singles to ignite the offense. Bostick would later score on a wild pitch, while Perez came around to score on a sacrifice fly by Mason Williams that gave the Tides a 2-0 lead. Two innings later, Perez opened up the seventh frame with a double off the left field wall before coming around to score on another sacrifice fly by Williams. On Monday, the Tides will continue their season-opening homestand by welcoming the Durham Bulls to Harbor Park for the first of a four-game set. Josh Rogers (0-1, 5.40) gets the start for Norfolk and will be opposed by right-hander Jake Faria (1-0, 5.87). Notes: The start of the game was delayed 10 minutes due to a brief rain shower just before first pitch… DJ Stewart singled, walked and swiped his third base of the season, giving him hits in seven of his last eight games…The two teams combined to go 0-for-11 with runners in scoring position…Norfolk, which entered the game leading the International League in fielding percentage, did not commit an error and turned two more double plays. The Tides now have 13 double plays turned in 11 games.